<<Scorpion Motorsports Video 3 wheel bike in action. Bigger isn’t always better. Case in point: the new Audi RS3 Sportback. Based on the compact A3, the RS3 sportback is a five-door premium sport hatch that packs a whopping 340 horsepower from its turbocharged five-cylinder engine – through to all four corners via Audi’s Quattro all-wheel drive system and seven-speed, dual-clutch transmission – to rocket to 60 in just 4.6 seconds. 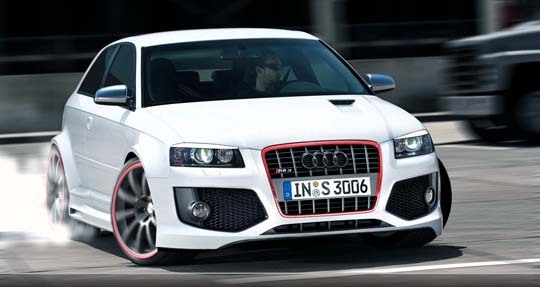 The RS3 Sportback’s nearly 50,000 euro pricetag in Germany would put it around $68,000 in the United States. Unfortunately, it looks like Audi doesn’t have plans to bring the RS3 to the U.S. shores anyways, but they weren’t going to import the RS5 or TTRS either. Lets keep our fingers crossed. This entry was posted on Thursday, November 25th, 2010 at 3:40 am	and is filed under Galleries, Motorsports. You can follow any responses to this entry through the RSS 2.0 feed. You can leave a response, or trackback from your own site.